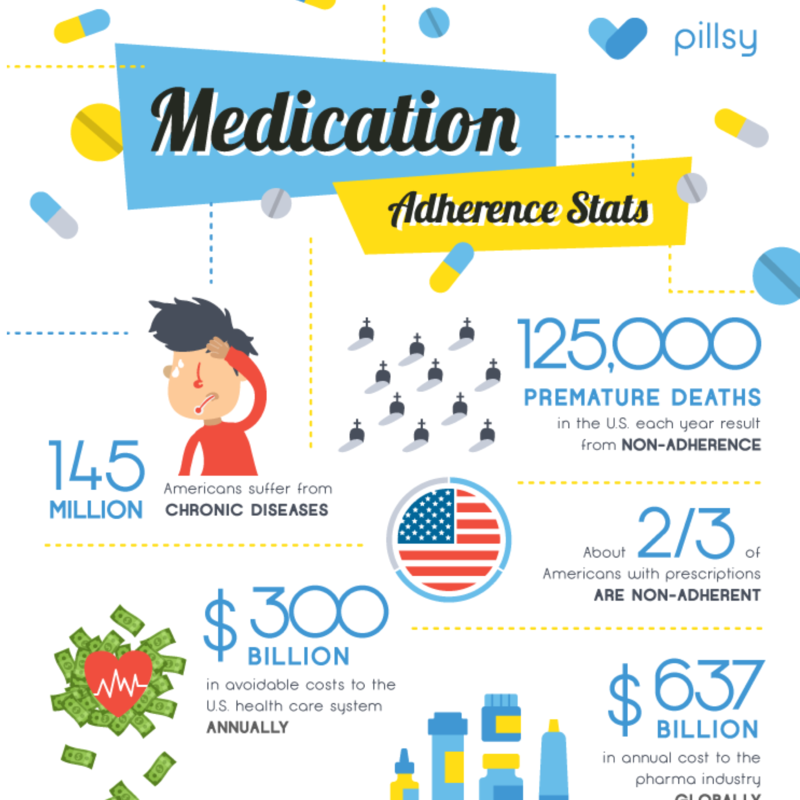 Today, medication non-adherence leads to 125,000 preventable deaths each year, and about $300 billion in avoidable healthcare costs. Most people don’t realize it but of dying from your own medication non-adherence are about 10 times greater than dying of homicide, or about 30 times greater for somebody who is over the age of 50. I’ve discussed the topic of with hundreds of people since we started Pillsy and while most people know somebody who has had problems with their medications they are almost always surprised by sheer scale of the actual numbers. It’s not a light topic, but I believe that people can benefit from more awareness about their actual risks, as opposed to sensationalized risks that make good stories for the popular media. Armed with accurate information about your actual risks, it’s possible to take actions that minimize most of these risks, possibly while also worrying less about the things in life that are out of one’s control. Sometimes we ignore the most dangerous risks, even if they are right in front of us. 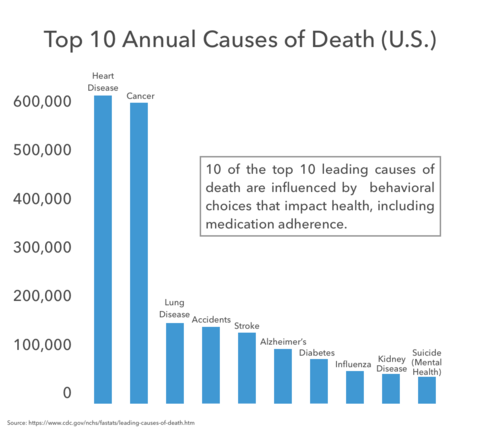 The reality is that that the vast majority of the top 10 causes of death in the U.S. are related to chronic health issues that are heavily influenced by the decisions (or lack thereof that individuals make over the course of their lives). In general, people don’t like discussing personal health issues, but the reality is that having a prescription medication is very normal. According to the Mayo Clinic, almost 70 percent of Americans take at least one prescription medication, and more than half take at least two. Although it’s incredibly important, because of the personal nature of medications there is usually very little social support provided. I know it’s uncomfortable but I personally think it would be great if more people helped their family members in this area, especially when they are developing new habits. Medication adherence saves money too. One researcher found that every 10% improvement in medication adherence reduces healthcare costs by up to 29%. In another large study performed with hundreds of thousands of people, Walgreens found that every 1% improvement in adherence saves about $50 in healthcare spending. For patients with chronic conditions like hypertension or diabetes, patients who took their medications as prescribed saved between $4,000 and $8,000 per year on healthcare costs, on average. In another study by a large employer, improving adherence was found to improve employee productivity by $18,000 annually. Among hypertensive patients 89,000 premature deaths could be avoided each year with appropriate medication treatment. 1 in 5 Medicare patients are readmitted to the hospital within 30 days. Half of them are considered to be non-adherence. Between 41% and 59% of mentally ill patients take their medication infrequently or not at all. This contributes to larger societal issues including unemployment, homelessness, and suicide. According to CVS, nearly 50% of people with a prescription for a chronic condition like cardiovascular disease stop taking it within the first year. CVS/Caremark research indicates that 68 percent of physicians are interested in receiving notices if patients become non-adherent. According to the CDC, about half of all adults suffer from chronic diseases. Chronic diseases account for 70% of all deaths in the U.S. (1.7 million per year). Heart disease and cancer account for about 50% of all deaths. Of these, heart disease is the most preventable. Almost 90% of prescriptions will be for generic drugs by 2020. For these drugs, adherence, not cost, is the main issue for most people. Researchers have been studying the causes of medication non-adherence for decades and hundreds of papers have been written. Some of the findings may surprise you. For example, younger people often have worse medication adherence rates than the elderly. In addition, most people do not consciously decide to stop taking their medication. Instead, they intend to take it. Then, they forget a few times they get out of the habit until they eventually stop taking it altogether. Their doctor may encourage them to restart the medication at their next physical (if they go), but otherwise it simply falls out of their consciousness. In 2011, Express Scripts ran a large pilot with 600,000 patients to determine the core causes for medication non-adherence. According to ExpressScripts “In contrast to the common belief that patients are nonadherent due to cost or clinical concerns, we found that over two-thirds of nonadherence was due to inattention and procrastination – 39% of nonadherent patients simply forgot to take their medications, 10% procrastinated on getting their refills and 20% did not renew their prescriptions on time. Taken together, forgetting to take medications, failing to get medications refilled and procrastinating on prescription renewals account for most non-adherence. Dozens of studies have been performed to determine who is most likely to suffer from medication non-adherence. Although there are some variables that predict better adherence, because of the enormous number of people who become non-adherence almost anybody can be impacted. One finding that is often surprising to find out is that younger people tend to struggle more than the elderly, possibly due to more complex schedules or less predictable routines. While people are more likely to struggle after receiving a new prescription, many others abandon their medications after months or even years. Unfortunately, even a person’s closest family members don’t often realize that they have become non-adherent due to the private nature of medications. By the time a person has stopped refilling their medications it’s usually too late to intervene. No feedback is given to the person taking the medication that could be used to improve their behavior. A large percentage of people have auto-refills for their prescriptions. In these cases, refill data may indicate an artificially high percentage for adherence. In reality, people end up stockpiling medications that they are not using (especially when these medications are paid for by their insurance). Their insurance pays for both the medication itself and the results of not taking it. Although medication is often a successful component of a preventative health strategy, there are also other important aspects to consider. Paying attention to your diet, exercise, sleep and stress levels are all important, as is getting a regular physical exam with your primary care provider. Depending upon your age it can also be helpful to keep an eye on your weight and blood pressure. There are a number of highly-rated apps and tech products out there to help in some of these areas. Medication non-adherence is an enormous problem that is still largely unaddressed by the healthcare system, but it’s not totally out of our control. The good news is that for every person who has issues with staying on top of their prescription there is another person who is doing fine. There are strategies you can take to maximize the odds of successfully managing medications, both for yourself and for your loved ones. We designed Pillsy using principles of behavioral science to provide people with an additional easy-to-use tool they can use get some extra support. You can harness some of these principles even if you don’t have our product and so I’d encourage you to learn more about them. A few forward-thinking people in academia and industry have been fighting to improve medication adherence for the past 40+ years and the battle will most likely continue for the next 40 years. Fortunately, several new technologies are emerging, like Pillsy, that may provide powerful new ways that end up helping. It’s our belief that the best products in this field will combine cutting-edge technology and behavioral science with designs and aesthetics that people enjoy using. We’re excited to be launching Pillsy as our first product and we’re further encouraged by what’s to come. Ajzen, I. (1985). From intentions to actions: A theory of planned behavior. In J. Kuhl & J. Beckmann (Eds. ), Action Control: From Cognition to Behavior (11-19). Berlin: Springer Berlin Heidelberg. Capgemini Consulting. (2012). Estimated annual pharmaceutical revenue loss due to medication non-adherence [White paper]. Forissier, T., & Firlik, K.
Lehrer, D.S., & Lorenz, J. (2014). Anosognosia in schizophrenia: Hidden in plain sight. Innovations in Clinical Neuroscience, 11(5-6), 10-17. NEHI. (2011). Improving patient medication adherence: A $290 billion opportunity.